(CBS News) While kids have plenty of time on their hands during summer vacation, one 15-year-old boy is learning that sometimes you need to take breaks even if you're just relaxing and playing games. 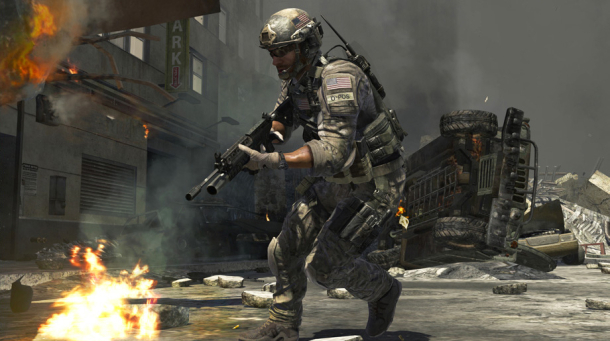 Tyler Rigsby, of Columbus, Ohio, was hospitalized after a marathon-playing session of "Call of Duty: Modern Warfare 3." His family told WCMH that her son had been playing at least four days, possibly even five. Rigsby only left his room to pick up snacks, use the bathroom and take a quick shower. On Tuesday morning, his mother, Jessie Rawlins, decided to bring him to his aunt's house. "It's like he was looking at me but he wasn't there. It was like he was looking through me," says Jennifer Thompson, Tyler's aunt, told WCMH. "We were talking and I heard a thump and I looked over and he just fell." Rigsby had collapsed. His mother said he turned very pale and his lips became blue. Then he collapsed two more times. Medics were called, and Tyler was taken to the hospital where he had an IV attached to him to replenish his fluids. He was diagnosed with severe dehydration. According to Mayo Clinic, dehydration occurs when you lose more fluids than you take in. Your body doesn't have enough liquid to complete necessary functions. Severe dehydration can lead to heat exhaustion or stroke, seizures, shock, kidney failure, swelling of the brain or coma and death. It might seem silly to forget to drink, but previous gamers who have become so engrossed have died because of playing for too long. In Feb. 2011, a Chinese gamer died after a three-day gaming session, where he reportedly barely slept or ate, according to the BBC. Another computer game-obesessed mother forgot to feed her kids and her dogs. The British woman was tried and sentenced to a suspended two year sentence, community service and banned from the Internet. That's not the only risk: Not moving for long period of time can also cause other problems. Twenty-year-old Chris Staniforth of Sheffield, England died from deep vein thrombosis (DVT), a condition that happens when a blood clot forms from lack of movement, according to the BBC. In this case, a blood clot in his left calf moved to his lungs, which caused a pulmonary embolism. And, just this past July, an 18-year-old Taiwaneese teenager died after a 40-hour Diablo gaming session, Yahoo reported. Authorities believe the long period of sitting and not moving, as well as not stopping for sleep or food, may have lead to blood clots. As for Rigsby, his mother reportedly said he was so shaken up by the experience that he didn't protest when she got rid of his Xbox.